A former employee of Hanga Abbey Mwalimu Abel Zenda died this December after suffering from heart attack aftereffects and numbness for about two years. Several monks of Hanga Abbey including former superior Gregory Mwageni, OSB, Frater Lucius Matembo (former student of Mwalimu Zenda) attended the furneral. 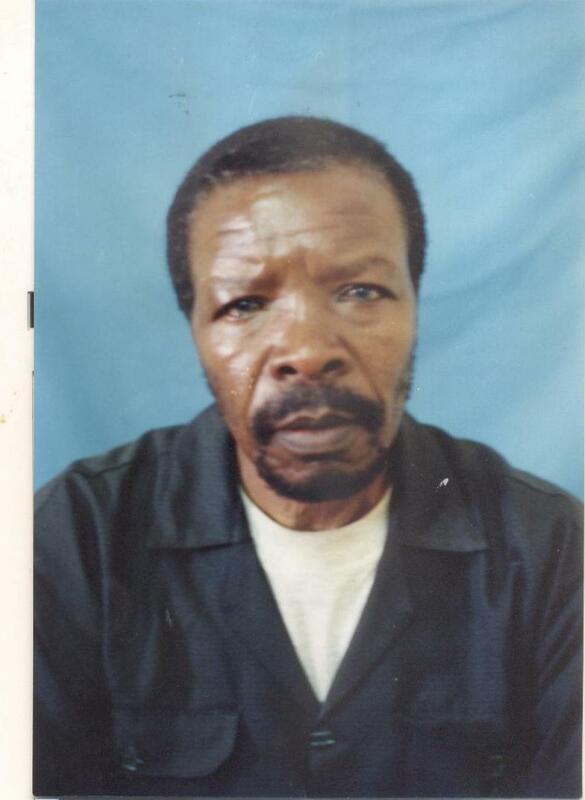 Mwalimu Abel Zenda was a headmaster at Hanga Seminary when the seminary was an elementary school back in the seventies. He was a tireless formator and never extradited a student for disciplinary matter. He knew how to shape troublesome students for which reason he was nicknamed by students "brashi ya chuma" meaning "iron brush!!" May he rest in peace! In the pictures; left Mwalimu Abel Zenda. 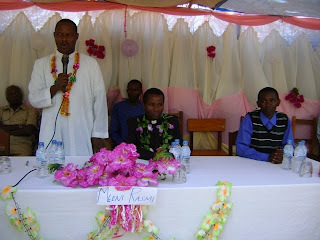 Right: Frater Lucius (our reporter) with two daughters of the late Mwalimu Zenda and Fr. 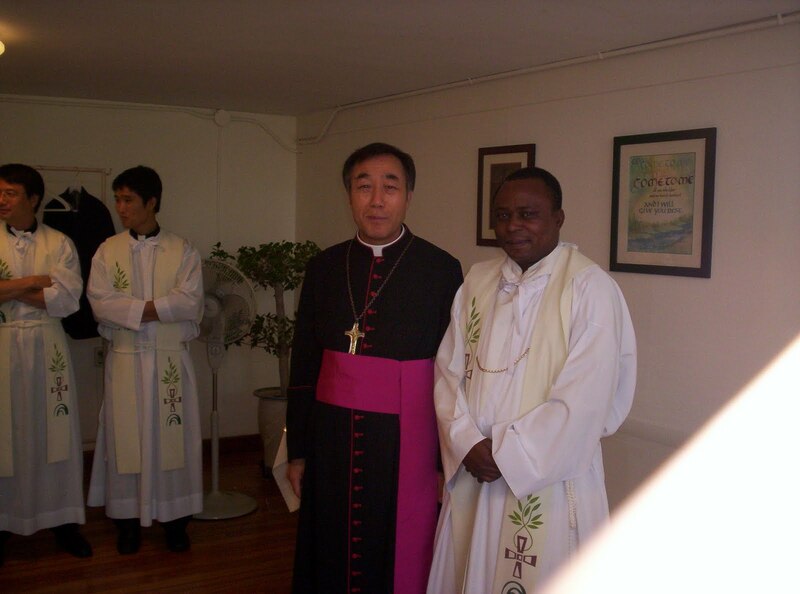 Gregoru Mwageni, OSB, in cassock, the former superior of Hanga Abbey who employed Mr. Zenda. 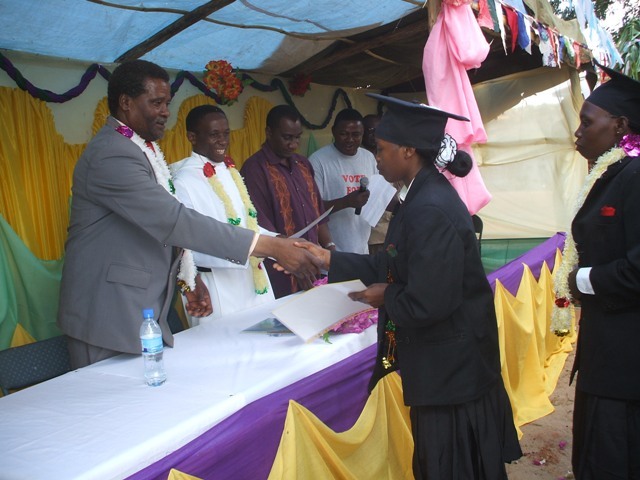 At Hanga Trade School this year 2010, on the 13th of November, 17 young men and women graduated with skills ranging from masonry, to carpentry, plumbing, automechanics, tailoring and electrical installation. The different skills learned during four years at school make them ready for self employment or be employed. It is nice to know that one trained in the trades can never lack a job unless he/she decides to do so. We wish them success in their lives!! In the photos: above - the class of 2010 graduates. 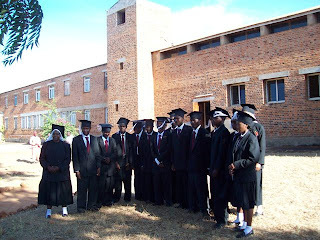 On the right from left is the guest of honor and Frater Parick Mwinuka, OSB, (in white cassock) the head of the Trade School posing with the graduates. 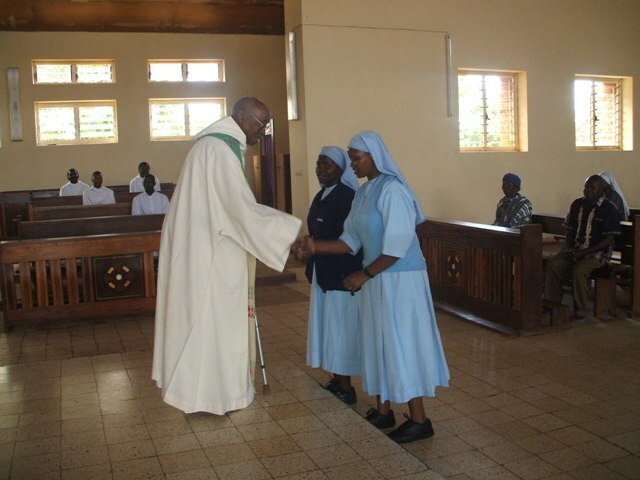 It is also worth noting that in this group of 17 graduates, there were two Benedictine nuns, Sr. Anita and Esther Ngowi, of the Camaldoles from Iringa (in the southern Highlands of Tanzania) who graduated in automechanics and plumbing respectively. Below: right - Sister Anita is holding her certicate after receiving from the guest of honor, and left- Sister Esther Ngowi is holding a gift box. It is that time of the year for Ordinary Level Secondary Schools in Tanzania to say goodbye to the Form IV students having completed their secondary school education. 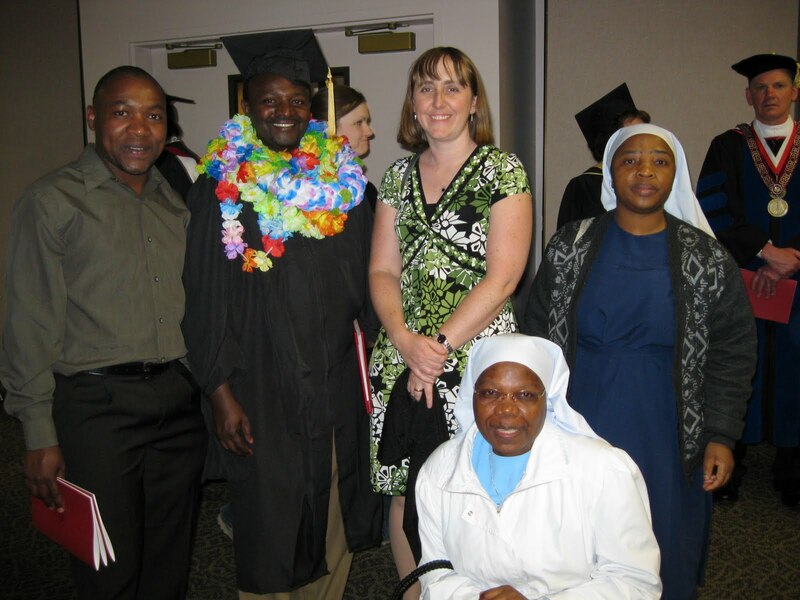 At Hanga Seminary, run by St. Maurus Hanga Abbey, there were 32 seminarians graduating. Some of these young men will go on to become monks, some will be priests and some, hopefully, very good and well formed catholics. This year's graduation was held on the 22nd of October at the seminary grounds. The guest of honor was Fr. 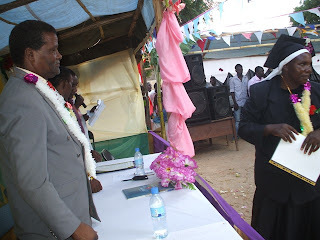 Christopher of Mbinga diocese (in southern Tanzania). In the photos: the graduating class with gifts from relatives, Fr. Chrysostom, OSB, giving a speech with the guest of honor on his left and our reporter Frater Lucius further left. Hanga Abbey is, once again this year, sending out envoys, the Form IV graduates who have been going to school for secondary education at St. Benedict Secondary School. This year's graduation was colored by two nuns of the Camaldole Congregation from Mafinga - Iringa (southern highlands of Tanzania) as first nuns to graduate from the school. In the photo Fr. 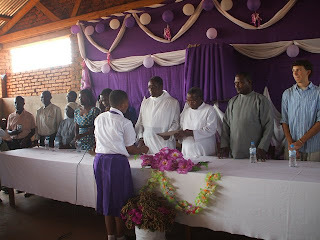 Eliyo the guest of honor handing school leaving certificates with Fr. Angelo Mugaga Mselle (the headmaster on his left) Below: the nuns are being congratulated by Most Rev. Placidus Nkalanga, OSB. Further below: our reporter, Br. Lucius also had the opportunity to pose with the graduates. Below some of the parents who came for the graduation cermony at St. Benedict Sec. School congratulating their children. Hanga Abbey dispensary has been granted donations to take care of patients with cataracts problems. 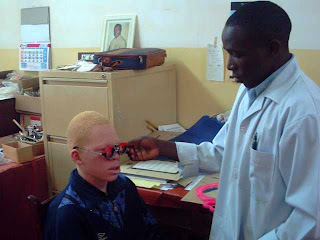 In 2008 eye optometrist Dr. Ed Tuhy from Klamath Falls, Oregon - USA discovered many people with the problem when he visited Hanga for eye glass prescription. Likewise this year 2010 Dr. Greg from Canada found more people with the problem and found out too that the patients can get the surgeries at Songea Regional Hospital for $30. Quite a few people have had the surgery. Our gratitude to parishioners of Sacred Heart catholic parish in Medford and St. Pius x Catholic church in Klamath Falls both in Oregon USA who donated for the cause. One girl of 10 years old, Jackline Lunji, had a complicated situation was to be treated in Muhimbili National Hospital, about 700 miles from Hanga Abbey. For her it had to cost $400 because of travel and living expenses in Dar es Salaam. Yet her story is a rewarding success story. Jackline after surgery; Br. Stanislaus treats her with antibiotic ointment. It all began with Dr. Ed Tuhy, eye doctor, who visited Hanga Abbey in June 2009. He discovered quite a few people with cataract problems. Then this year Dr. Greg from Canada saw the same problem but noted that sugeries can be done in Songea Regional Hospital, 50km from Hanga, for $30. Already some have gotten the sugery. We thank parishioners of Sacred Heart in Medford and St. Pius X in Klamath Falls, both in Oregon - USA, for their generous donations for the cause. 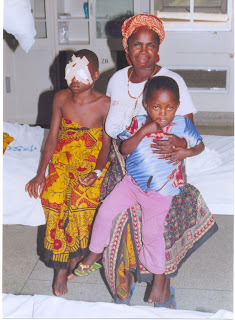 A unique case happened with a girl of 10 years old, Jacline Lunji, who had to be refered to Muhimbili National Hospital in Dar es Salaam, about 700 miles, from Hanga Abbey. She had stopped going to school for two years since she could not see. Her sugery went well and now she goes to school. It is definitely a rewarding story to hear! Fr. 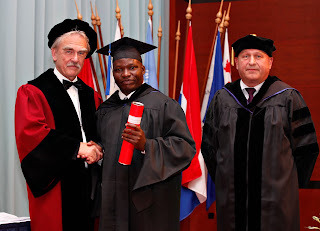 Novatus Ngonyani, OSB, of Hanga Abbey just graduated this last September 13th with MA in Business Management. He earned the degree in Holland at Maastrict School of Management within a year of hard work for it was a degree to be studied for two years! It almost crushed his head, but he prevailed! "Mwanaume wa shoka" translated as "A man of hard work and great determination!" We congratulate him for the achievement. In the photos: top right Fr. Novatus getting a hand shake of congratulations from Dr. Peter de Gijsel and on left is Professor Aad van Mourik. Top right Fr. Novatus with some monks of Benedictusberg Abbey of Solemes Congregation: Fr. Martin Werry, Ans, Francine van Tuijl, Fr. Novatus, Abbot Adrian Lenglet and Markus Ballhausen from St. Ottilien. Bottom Fr. Novatus with fellow graduates from Tanzania. Early this September 2010 the Regional Commisioner of Ruvuma Region in Southern Tanzania, Dr. Catherine Ishengoma, visited Hanga Abbey to see monks and their activities. While at the abbey she was able to see sites such as cattle farm, piggery unit, chicken shed and carpentry. In the photo: top left Dr. Catherine is talking with Br. Odo Nanyanje, OSB, at the carpentry unit; middle right, she is talking to Fr. 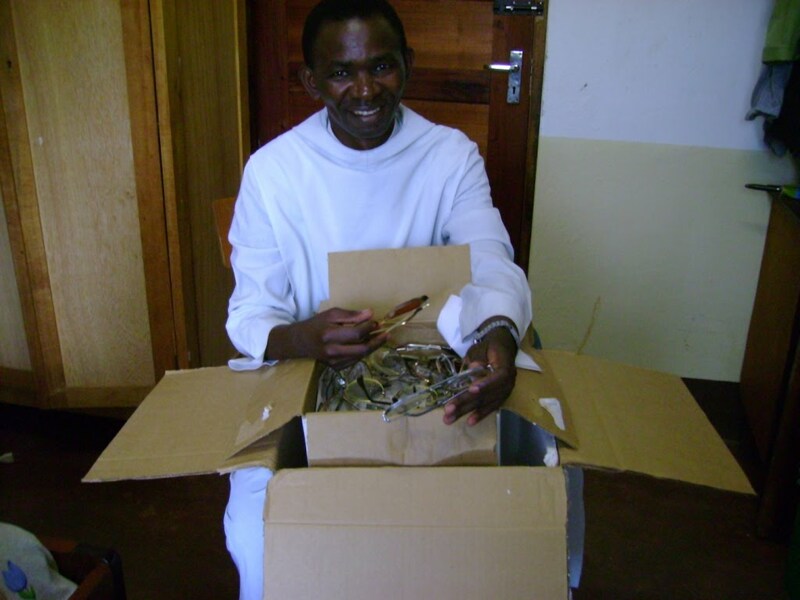 Gregory Mwageni, OSB, the pioneer/founder and first superior of Hanga Abbey. Bottom picture: Dr. Ishengoma listens to Br. Peter Claver, OSB, about raising chicken for eggs. Forgotten news! Frater Narsis (Nolasco) Mwalongo, OSB, our own monk of Hanga Abbey graduated last May with Masters in Psychology and Counseling. Now he lives in Klamath Falls (Oregon) for a year of on job training. Good luck to him. Contact him if you feel like confused with life!! In the photo Frater Narsis is with some of his friends who participated on his graduation day including Srs. 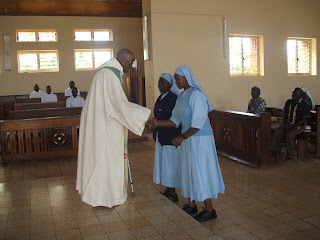 Anamaria and Redempta of Chipole convent in Tanzania. No dull moments at the dispensary at Hanga. Br. Lucius is keen to help people with their health. In June he invited officials from National Health Insurance so that people served at the dispensary could use the service. You can see in the picture Br. Theodory & Br. Lucius (second from left) with the officials. Br. Lucius has also launched a program to educate children how to take care of their health. Recently he and his staff members visited the elementary school pupils around Hanga Abbey and educated them on how to keep their teeth healty. In the photos Br. Lucis and onother Nurse checking pupils' teeth. alsto the dispensary had the honor of the visit of Dr. Mario from Italy. He comes every year to help out at the dispensary. Hes has been a good benefactor for the dispensary. You can see Dr. Mario (second from left in the picture) with his fellow Italians when they visited Hanga in June/July. The Abbey St. Bernard's dispesary is expanding its service an endeavor that began last year with Dr. Ed Tuhy from the US to serve people with eye sight problems. In the move our Frater Stanislaus Mwinuka, OSB, is being trained temporarily at Songea regional hospital (close to Hanga Abbey). Later on the Brother is expected to go to school of optometry in Moshi (northern Tanzania). Since the school in Moshi is very competitive in terms of opportunity, it is hoped that through recommendation from Songea hospital will increase the chances of being accepted for the schooling. In the photos: Frater Stanislaus in practice at Songea regional hospital. ............... ... ... ... ... We congratulate our confrere Frater Josephat Haule, OSB, our own monk, for graduating with diploma in nursing. On July 31st a few monks went to attend his graduation ceremony at St. Joseph Hospital in Peramiho, about 1.30 hours car drive from Hanga Abbey. We are very happy to have more of our monks in the medical field since it is such a need for the people we serve at our dispensary which is always congested with patients. In the photo frater Josephat with monks and friends who attended his gratuation ceremony. 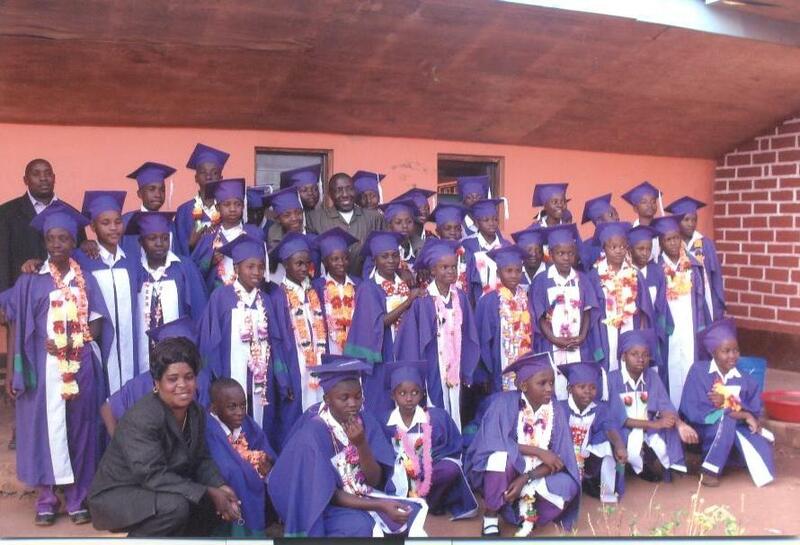 St. Laurent Primary school has 42 pupils of Standard Seven graduating this year. They are expected to sit for their final national examinations sometime this year 2010 before the general elections of senators and president in October in the country. The class had their graduation ceremony early July this year. We wish them good preparations for their final examinations.